If you’ve ever worn a t-shirt with a logo emblazoned across the chest – whether ironically or not – you’ll probably be interested to know whether you’ve been wearing a true work of art or not. Well, wait no longer because a poll has discovered which logo is the most iconic t-shirt design of all time. Apparently, the famous Rolling Stones ‘tongue and lip’ logo comes in first, beating fierce competition. The famous motif was created in the 1970s and was said – by designer, John Pasche – to resemble Mick Jagger’s own lips, as well as capturing the band’s rebelliousness. It’s really the most evocative logo of any band. By distilling the essence of the band into one single visual reference, the designer was able to create a logo that worked superbly well for 50 years. 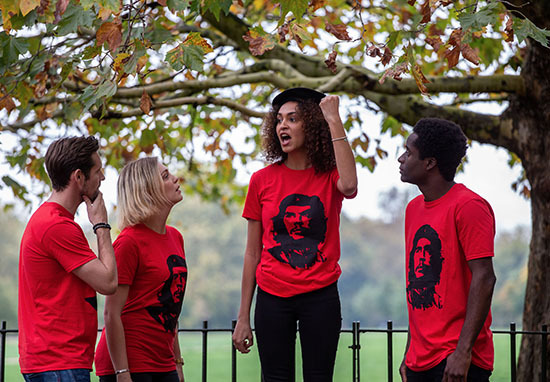 And it appears it’s still going strong, as it beat off competition from the well-known silhouette of Che Guevara – which came in second – and the popular Hard Rock Cafe logo, which came third. As for the sporty ones of you out there, Nike’s ‘Just Do It’ motto/logo came in fourth. The research of 2,000 UK adults was commissioned by Day2 dry wash, a dry shampoo for clothes, via OnePoll. Our research has shown we’re a nation obsessed with tees. Since the US Navy first wore them under their uniforms in the 19th century, they’ve become a staple in our wardrobes, and our lives. But while it’s clear we have an emotional attachment to them, we were surprised to find so many Brits will actually go out and buy a new t-shirt because it’s easier than washing one they already own. Also appearing in the top 10 were the Superman logo, the 1980s ‘Frankie Says Relax’ design – popularised by the band Frankie Goes to Hollywood – and the classic ‘I Heart NY’ print. Other popular t-shirts include the triangle refracting light, also seen on the cover of Pink Floyd’s Dark Side of the Moon, and the Batman logo. Moving away from logos, the research also found Brits typically buy five new t-shirts a year, wearing their favourite an average of five times a month. However, one in six admit to buying a completely new t-shirt occasionally to avoid washing one they already own. Guilty as charged! A third of those polled said their t-shirts hold a lot of importance to them, bringing back some of their favourite memories , with 36 per cent feeling sad if they have to get rid of one which has been given to them by a loved one. And one in three still wear their favourite t-shirts even if they have holes in, or are damaged in some way. Men are apparently the most sentimental about their beloved tees, with a quarter never throwing them away, compared to less than a fifth of females. It also emerged the average Brit typically wears a t-shirt twice before washing it and puts an average of three washes of clothing on per week, before spending 43 minutes a week doing the ironing. Phew, it’s tiring me out just thinking of it. Day2 is the perfect solution to our laundry dilemmas, transforming a creased tee that’s been left on the chair-drobe into looking just-ironed, feeling just-washed and smelling fresh in minutes. Beyond that, it’s helping to banish that throwaway attitude to clothes that’s being fuelled by the rise of fast fashion, encouraging consumers to re-wear, wash less and show their clothes some love. Get digging those tees out guys!